Photo printed with a rather extensive border totaling 3.75 x 6.75 inches, inserted into a folding cardboard holder, which I have removed for this scan. Photographer is White Studio of New York City. Otherwise undated and unidentified. I try to mix things up with this blog, to post photos of people of different ages and genders, individually and in groups, studio portraits and snapshots, different time periods, etc. It’s just my effort to accommodate the different interests of the people who might be reading it, and to provide variety as a way of avoiding monotony (for my own sake if nothing else). So after a weekend of nurses and pretty coats, I figured it was time for a man. And not just any man, but a strong, lantern-jawed man in uniform. I love this guy because he seems like a decent, handsome guy, but his look almost crosses the line into caricature for me. Unlike some of the people in uniform whose pictures I have that were taken by small-town studios, this guy could almost be from anywhere, since half the world seems to pass through New York City at one time or other. Maybe he’s from Upper Podunk and got his picture taken before shipping off overseas, or maybe he spent his whole life in Manhattan. I just don’t know. 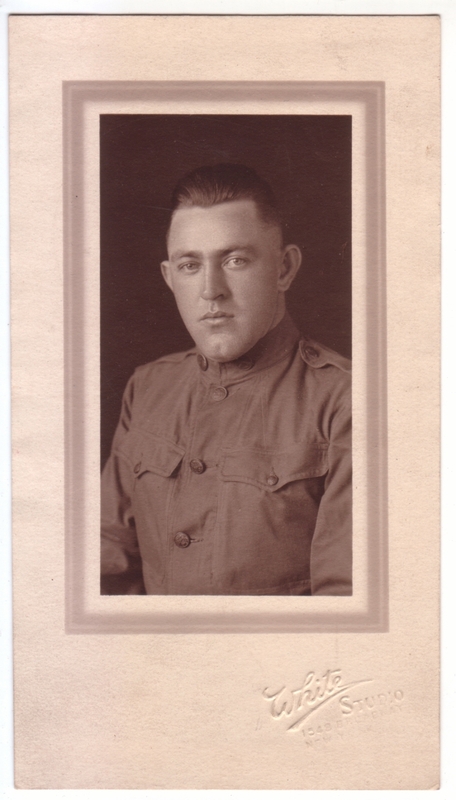 As for guessing the date, I think he’s wearing an Army tunic in a style circa WWI, but I’m not sure how long that style was around. Reminds me of WWI photos my grandfather kept. Wish I’d paid more attention to them when I was little, but I was mostly into his helmet! I like this photo. He’s got life lived in his eyes and expression. He looks like he has some stories to tell, and it looks like there may be a mischievous glint in those eyes too. Very interesting. I agree! I remember the talk show host Charlie Rose once said that anyone is interesting if you talk to them long enough. But some people, like this guy, look interesting right from the start.